A sign warns people not to swim in the outflow area that leads to the Pacific Ocean at Will Rogers State Beach in Los Angeles. At a press conference at the beach Thursday, the Natural Resources Defense Council said it was suing the Environmental Protection Agency, alleging it had failed to protect beaches across the country from pollution. 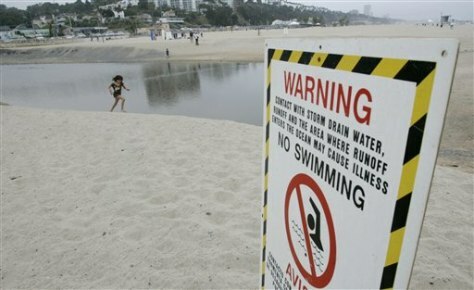 Will Rogers is also on the annual NRDC list of dirty beaches.